My client Abbey goes marriage counseling with her husband twice each week, where they discuss what’s not working in the relationship – mostly from Abbey’s perspective, since she’s the one that is unhappy. She doesn’t feel at home in her own home, so the counselor and her husband suggest she go buy some things she likes to put in the home to make it better represent her style and tastes. But, that’s not the real problem. She shares that she doesn’t feel heard and so the counselor is teaching her husband better listening skills. But his ability to listen isn’t the issue. Abbey is supposed to supply the reasons for why she’s unhappy and unfulfilled in her marriage, and the marriage counselor provides suggestions for each of those reasons for her husband to react to, resolve or fix. But in all that time identifying and attempting to slap a band-aid on each individual problem, they’re avoiding the root of the problem. They’re not talking about the heart of the matter. They’re not discussing what’s missing in how Abbey wants to feel in the creation of the life she wants. It’s time to take the conversation deeper. Abbey wants to feel adventurous in her life and full of possibilities. She wants a relationship that isn’t just fine, she wants it to be extraordinary. She wants to have butterflies when she looks at the one she loves and smiles. When she lays her head down on her pillow at night next to her Beloved, she wants to feel warm, calm, and peaceful. She wants to feel that there’s no place else she’d rather be. And she doesn’t – and frankly never has – felt any of those things in her relationship with her husband. I know what Abbey is feeling. 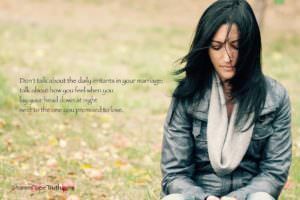 I remember being in my first marriage and telling our marriage counselor, “If I created a checklist for my husband to check off the 28 things he needed to do each day in order to make me feel loved, he would have attempted to check the boxes every day on that list.” But the truth was that I didn’t know how to tell him to make me feel adored and seen, heard and valued. I didn’t know how to create that checklist, and even if I did, I wouldn’t have known how to receive it. That just wasn’t the type of relationship we had ever had together. Where’s the hurt and have you expressed to your husband that hurt? Does he think you’re bitching about helping with the kids and spending more time with the family or does he realize that you feel like you have a warm body next to you, but alone and abandoned in your life? Quit talking about the day-to-day irritants and begin discussing how those instances make you feel. I could bash marriage counseling or therapy, but that would be disingenuous. I’m a product of therapy myself. My therapist helped me understand how I had gotten to where I was, but he couldn’t pick me up, brush me off and move me forward. If you’re ready to move beyond just melting down – and get out of the pain – that’s where coaching can help you go a little a deeper and get at the heart of the matter so that you can get the clarity you need and move forward.